Munich - FC Bayern München's 2-0 win over 1. FSV Mainz 05 was a prelude to the real story of the day in Munich, as the Bavarians celebrated winning the Bundesliga title for a 24th time. Jerome Boateng: "It wasn’t easy to give Pep Guardiola a beer shower today as he hid himself better than he did last year! I hope we win the Bundesliga again next season but for the moment it’s time to celebrate this year’s championship because we’ve really deserved it. Today we’ll celebrate because that’s what we fought for from the start of the season. We’re not thinking about the finals [we’re missing out on] in Berlin." Thomas Müller: "I hope there won’t be any footage of me dancing on the internet after tonight’s party like there was last year! Obviously moments like these are what you work towards. It’s nice when it’s over but on the other hand, we’re athletes and we’ve got a big long break now. The fans have got nothing to watch and we’ve got nothing to play, but obviously we’re very happy to have won the Bundesliga so convincingly." Juan Bernat "I’m delighted to have won my first Bundesliga title. It’s been a great day celebrating with the typical beer showers and everything so I’m really happy. I’m very satisfied with my first season here in Munich. I’ve played a lot of games and I feel good here. It’s a shame that we didn’t make it to either of the cup finals but I think it’s been a good season and we’ll be back next year. The only German party I’ve been to before was the Oktoberfest and it was great, so I’m looking forward to tonight’s celebrations." Philipp Lahm: "Obviously we can let our hair down tonight. We’ve had a successful season as we’re top of the league after 34 matchdays. Of course we wanted to win more this season but doesn’t mean you should belittle winning the league. We should have a big party because it’s a big title." Robert Lewandowski: I’m not sad at being substituted. Of course I had a small chance [of finishing as Bundesliga top scorer] but there’s always next season. I’m really happy that we’re champions and we had a great season. I was a bit surprised at being substituted but this was possibly Claudio’s [Pizarro] last game - I don’t know if it was. Johannes Geis: "If we’d had more purpose in with our finishing then we might have been able to get something here, but Bayern played well today and deserve to be champions. We’re still in the Bundesliga next season and that’s what counts so it’s all good." Daniel Brosinski: "Yunus [Malli] just waited too long [in is one-on-one chance with Manuel Neuer], but I don't want to criticise him for that. We actually played pretty well today but after we went 1-0 down it was tough. We've had a good second half to the season. I'm a bit sad it's all over now but on the other hand it'll be good to have a rest and go on holiday." 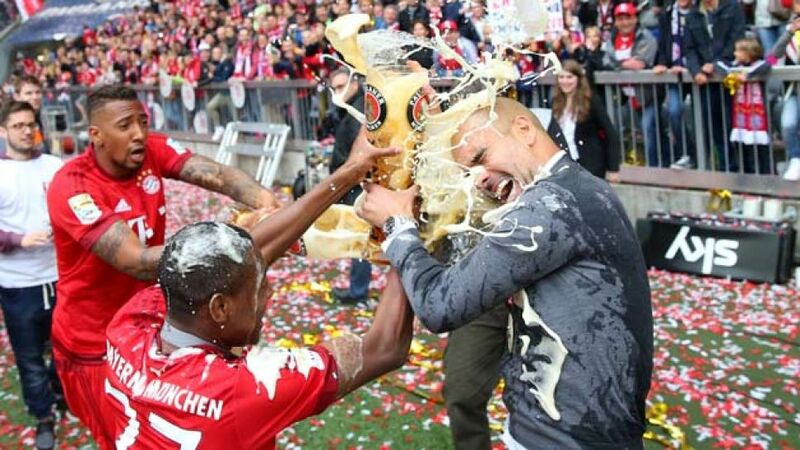 See what happened once the beer had been washed off and Bayern's players took their celebrations into the Munich city centre in the below video, courtesy of the Bundesliga's official YouTube channel.